Starling murmurations, where thousands of birds flock together, swirling in the sky at dawn and dusk, are one of the ultimate winter spectacles. 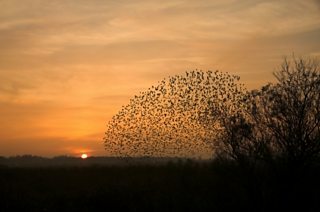 During the colder months, up and down the country, hundreds of thousands of starlings darken the sky with these incredible, acrobatic displays on their way to or from their roosts. We've been lucky enough to film them in the past, such as this display by Aberystwyth pier. As ever, we've love to see your sightings. Please share your links below or to the Winterwatch Flickr Group. A flock of starlings funnels down en masse to roost on Aberystwyth's pier. So where is your best chance of spotting this spectacle? The County Bird Recorders and the RSPB regional and county teams have kindly put together a list of sites that are either currently known to have starling roosts or those where there is a high probability before the winter is over. There is no guarantee of a spectacular sight as the birds can move around from roost to roost and the display can depend on timing, the number of birds and the presence of predators. Thanks for all your tips in the comments below. And here's just a few of your replies via Twitter. Marazion marsh in Cornwall can be great, Cornwall's biggest reed bed, spectacular sunsets that far west too! @jsmithywt growing bigger and bigger by the day! Started at around 10,000 birds as in this video, but now at around 20,000! Jenny Heath The Albert Bridge and also the Queens Bridge in Belfast. Spectacular! Deborah Marland Watched one at Leighton Moss a few weeks back it was spectacular. Angie Hill There's a nice one building up in Worcester at the moment. Not a startling number of starlings ... but approx 1000 which is good for starters! Pete Clark Theres one near me around the English, Welsh border at Pulford/Rossett, admittedly the murmuration normally form over the fields about a mile away some we often get a dozen or so flood the garden cleaning out the bird tables and fat balls! John Walsh Brighton Marina is the place to be now that the old West Pier no longer allows them a roost at night. Frances Palmer Starlings put on a good show over the pier at Eastbourne. I've often seen them and it is spectacular! Clare Checkley Aberystwyth pier is a fantastic place to see the starlings... either watch from the prom or if you're feeling brave (and don't mind bird droppings!) actually on the pier end itself, where you can fully immerse yourself in a murmuration - an awesome experience! Have we missed any? Drop your tips in below please!